shoespek has no other items for sale. This is honestly my fave gun rn! Shoots well but not that accurate. I recommend. Fast shipping and exactly as they said. 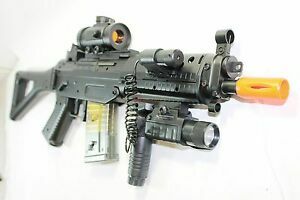 This airsoft rifle iS full of options. My son really enjoys this. Nothing on that gun is made of steel- not one thing. After testing 3 types of .12g and 4 types of .20g BBs, it will not fire .20g BBs unless the gun is fired upside down, at what appears to be 20FPS. So, .12g BBs are your only option here. The spring in the original magazine jammed after 3 days of light use, rendering the magazine useless. The thread for attaching the compressor to the barrel of the gun was warped, so the compressor was angled up, causing the BBs to fire way off target. These are just a few of the issues i found with this product. I have a spring loaded 1911 airsoft handgun that fires more accurately, with no issues- and was only $10. This M82P is a classic case of false advertisement. He loves it so much, we had to order an extra clip.